Find us and contact us with ease. Situated in South East Asia, Phuket Island is located in the southern part of the Kingdom of Thailand, which is sandwiched between Laos to the north, Burma to the west, Cambodia to the east and Malaysia to the south. Phuket is some 867 kilometers southwest of Bangkok, Thailand’s capital city. Bangkok is a major international aviation hub and Phuket has its own international airport some 30 km north of the hospital. Flight times from Bangkok to Phuket are around 1 hour. The island lies in the Andaman Sea, across from 7’45” to 8’15” North Latitude and from 98’15” to 98’40” West Longitude. Phuket is also connected to mainland Thailand by the two parallel bridges, making road transportation possible. 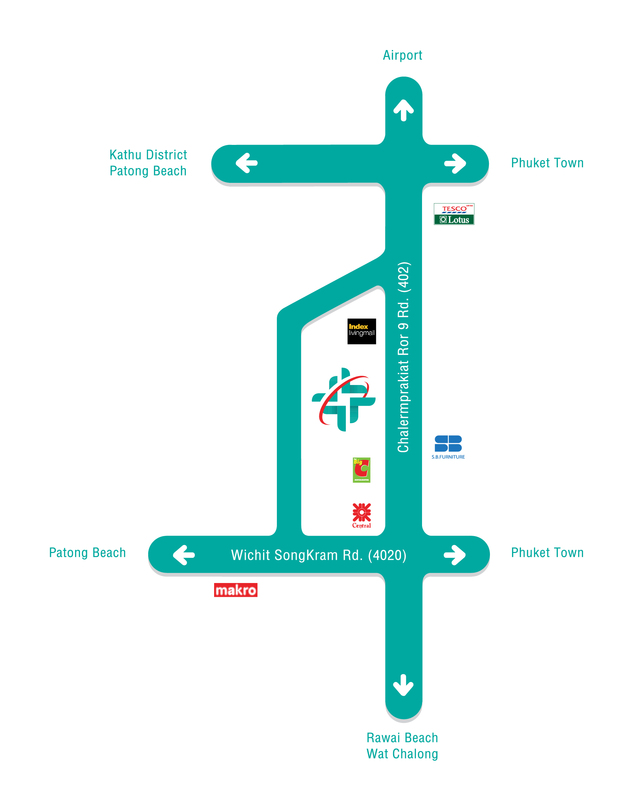 Siriroj International Hospital is conveniently located just outside Phuket town on highway 402, between Central Festival shopping mall, Big C and Tesco Lotus Superstores and it is easily accessible by automobile and public transportation.